There is always some question about exactly where the border between SkyClan and ThunderClan lies. Marked where the younger forest of ThunderClan meshes with SkyClan's patch of dense oaks thrive, the exact location is a hotly debated issue. Or at least, it has been in the past. It is currently drawn where the thickest of the oaks start, and follows their path. The large and looming Thunderpath breaks through the forest and separates Shadowclan from Windclan and Thunderclan. 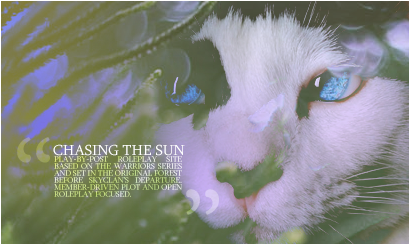 It cuts through slightly higher above the forest around it, raised high enough that between ThunderClan and ShadowClan and tunnel can be seen joining the territories. No landmark in the clans is more dangerous than the Thunderpath and its howling monsters. The forest has to end somewhere, and that somewhere happens to be right next to the river. This patch of land is where the trees thin out, and where the sunning rocks can be found, so it is only natural that there is always some sort of trouble here. Currently the rocks are controlled by ThunderClan. Down the river, at the very edge of RiverClan's territory, there is a point where ThunderClan's territory stops, and SkyClan's begins. Here, the border between RiverClan and SkyClan is formed, marked by the riverbank on SkyClan's side. While they are permitted to drink from the water, hunting and swimming are deemed RiverClan's right, and cats caught tend to be challenged for trespassing. The border of Windclan and Riverclan is the river, which runs alongside a steep cliff on Windclan's side and a gentle bank on Riverclan's. The steep cliff is referred to as the Gorge and every cat would do well to stay away the edge. At the end of the Gorge is a waterfall, signalling the end of Windclan territory. A twoleg dump, this place is riddled with disease and filth. However, during the tough times of leaf-bare, the rats that crawl and creep through the heaps of trash and waste become a vital source of prey. alpine 3 117 by just atlanta.